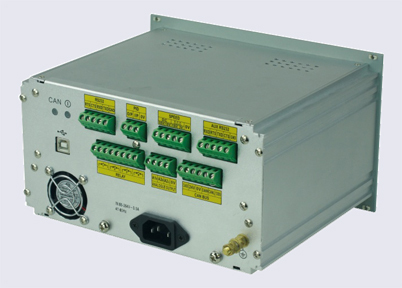 Provides PI control of insulation thickness on wire and cable insulation extrusion lines. Integrates seamlessly with one Proton Products InteliSENS®DG series diameter gauges for insulation diameter measurement (also compatible with diameter gauges from other manufacturers for integration into existing production lines). The Proton Products NEXiS® CS2G Series of controllers are for use on wire insulation or other extrusion production lines. 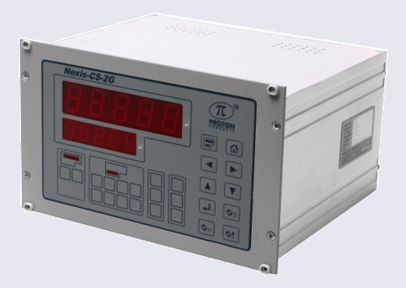 NEXiS® CS2G Series controllers connect to Proton Products diameter gauges and speed and length gauges for measurement of insulation diameter and line speed respectively. These measurements are then fed into a PI feedback controller whose fully-isolated and floating output may be used to drive insulation extruders or capstan drives. Insulation diameter is thus actively controlled and kept in tolerance by the NEXiS® CS2G controller. The NEXiS® CS2G is connected to the Cold DG diameter gauge after the water cooling trough. The Cold diameter measurement is used to control the extruder so that the final insulation diameter is held within tolerance. Since the Cold diameter measurement is located far from the extruder, this control system response time is relatively slow (and dependent on the line speed), but no shrinkage offset is required. The NEXiS® CS2G is connected to the Hot DG diameter gauge before the water cooling trough. A shrinkage offset due to cooling is set by the operator and used in conjunction with the Hot diameter measurement to control the extruder so that the final insulation diameter is held within tolerance. Since the Hot diameter measurement is located close to the extruder, this control system response time is relatively fast. NEXiSTM CS2G-10 For connection to single-axis (DG1xxx) Proton Products DG Series Diameter Gauges. 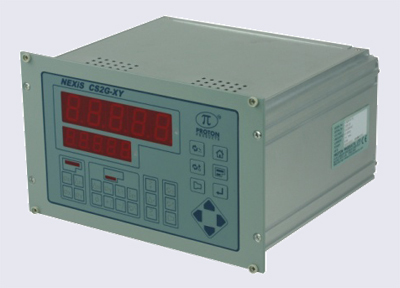 NEXiSTM CS2G-10XY For connection to dual-axis (DG2xxx) Proton Products DG Series Diameter Gauges; controls the average of the X and Y diameter.